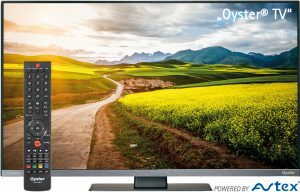 The new „Oyster® TV“s are LED TVs that are available in the screen sizes 19“ (47 cm), 21.5“ (55 cm), 24“ (61 cm) and 32“ (81 cm). They are equipped with a standard VESA mounting bracket that makes them easy to install for any specialist workshop. The refined design of the LED TVs underlines the high quality standards of ten Haaft, and the high level of contrast ensures that customers can enjoy an unspoiled viewing experience even in the "brighter" environment of camper vans, trailers or mobile homes. As an alternative, we also offer a DVB-T / DVB-T2 tuner for cases in which the line-of-sight connection to the satellite is blocked or for customers who prefer to park in a shady location. In addition, the integrated CI / CI+ module slot also enables reception of TV stations (including Pay-TV) from almost all countries in Europe. Via the available USB ports it is also possible to record programmes onto an external storage device and – of course – play them back. This is facilitated by the on-screen electronic programme guide (EPG). "Oyster® TV" - Can I connect this new TV set to my already installed Oyster® or CARO®+ antenna? Should you already own an "older" Oyster® or CARO®+ satellite antenna, you can of course connect the new "Oyster® TV" setto them. However, the functions of the system remote control will in this case be limited to the TV set. The satellite antenna will continue to be controlled via the existing remote control or the control panel. „Oyster® TV“ 19" / 47 cm Data Sheet Oyster TV 19"
„Oyster® TV“ 21.5" / 55 cm Data Sheet Oyster TV 21,5"
„Oyster® TV“ 24" / 61 cm Data Sheet Oyster TV 24"
„Oyster® TV“ 32" / 81 cm Data Sheet Oyster TV 32"